Collaborations between brands are getting increasingly popular. Probably one of the most well-received of this year’s collaborations was when Supreme teamed up with Louis Vuitton. The resulting items were in huge demand on online platforms. This week, it was announced that Supreme and Nike will be unveiling another joint project on September 7, 2017, in New York, London, Paris and online. They aren’t exactly reinventing the wheel, but when two favourite brands join forces, fans are bound to love the results. 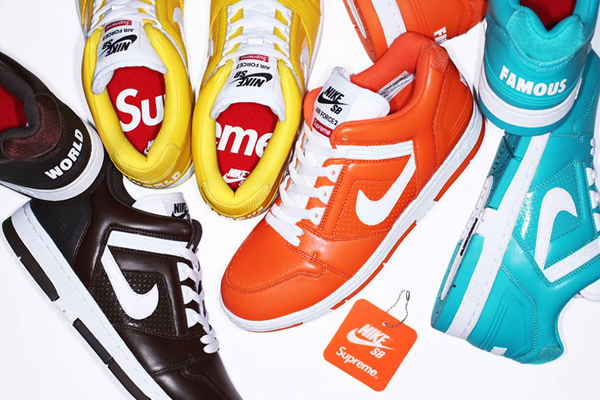 This time, feast your eyes on the Supreme/Nike Air Force 2. The famous leather shoes that everyone will be fighting over come in four eye-popping colours: tangerine, teal, lemon yellow and chestnut brown. The inside of the shoe features the classic red and white logo while the heels sport the words “WORLD FAMOUS,” (one word on each heel), not to be too immodest! Supreme/Nike Air Force 2 shoes are only available at Supreme, for $98 USD. Good luck nabbing a pair!